The new Men's One Riviera Low Waste Short is the ideal swimsuit for those intense training days. The black and multi coloured shorts designed with a 14cm leg and internal front lining, these shorts provide exceptional comfort and freedom of movement when you need it most, during an intense training session. The One Riviera is designed using Arena's Maxlife 100% polyester. 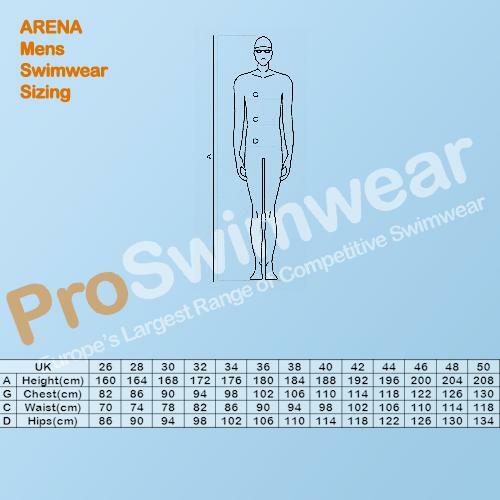 This material is an exclusive from Arena having 100% PE fabric that guarantees maximum resistance to chlorinated water. Max Life PBT construction is a specifically engineered PE yarn that provides excellent elasticity. After more than 240 hours of usage Max life will still keep almost 95% of its original characteristic. With its quick drying, 50+ UV protection and the way it combines excellent fit with power retention performance, this is the perfect suit for the intensive swimmer.